In this collection you can find all the small wooden tools you will need in your kitchen. They are great for everyday use and for entertaining. They also make wonderful hostess gifts and stocking stuffers! We design all our Rock Maple utensils for practicality of use. Our shapes are unique and work perfectly with the pots and pans on the market today. Our collection includes: tongs, spoons, spatulas, knives and much more. We make our Butcher Blocks the old-fashion way. They have stainless steel rods going right through and they are then tightened and bolted. No Glue! Our boards are lifetime boards! 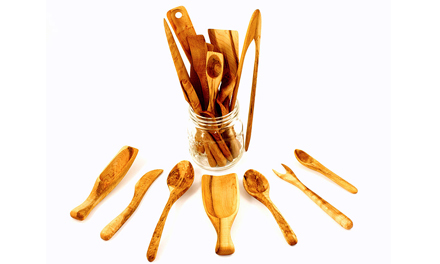 At Imagine Wood a wooden spoon is not just a wooden spoon! Our goal is to design wooden tools that really work for you in your kitchen.Over the last 15 years our collection has grown considerably and we continue to create ergonomic kitchen tools daily, taking into account the angles and shapes of today’s cookware and considering the need of our customers. Most of our spoons and spatulas are ambidextrous and for those few that aren’t, we have designed both left and right-handed options. All our tools are made of hand-picked “Rock Maple”, which is the bottom 8 to 10 feet of the Sugar Maple Tree grown here in Ontario. 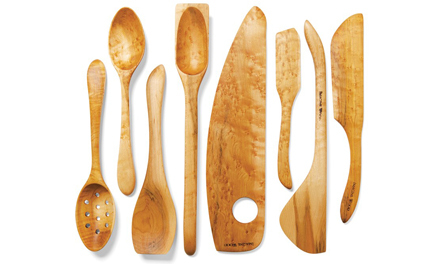 This wood is extremely hard and dense making it the perfect wood for kitchen utensils. 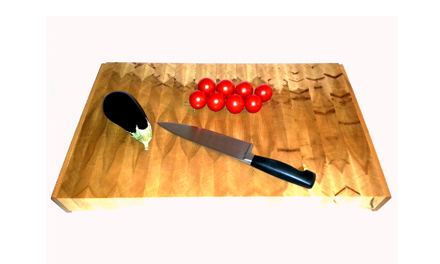 Because of these natural properties in the wood, our products will not stain when you are cooking, for example, with tomatoes or curry. Rock Maple also has antibacterial properties making it a safer and healthier choice for food preparation. They can be used on ceramic, Teflon or any good surface you are working on and the only finish on all our wooden tools is Olive Oil, no wax or fancy maintenance necessary: Soap and water wash and just re-oil once in a while. 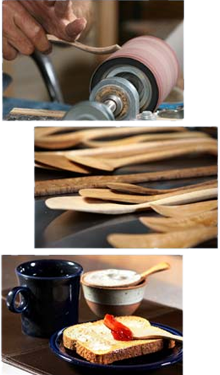 Explore Imagine Wood products and see how our utensils will enhance the culinary artist in you.